I wish to share a few thoughts about our own journey, that is CCT. I have been truly blessed in my life to have achieved this kind of success and recognition. I attribute them to the invaluable support of my loyal fans, well wishers and elders. 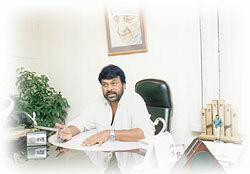 Chiranjeevi eye and blood bank research and development center is the result of my quest to find an outlet to give back a small portion to the society, that has bestowed on me something I will never be able to fully repay. Initially I was a bit apprehensive, about how far I would be able to carry this mission, of providing free blood, how consistently will I be able to secure the support of my fans in blood donations. However my fans have amazed me time and again with their overwhelming response. Not only them but bank employees, police officers, house wives, physically challenged people, in essence, people from all sections of the society have shown tremendous amount of enthusiasm to participate in this great human cause . There have been occasions wherein some house wives confided in me about finding a genuine means through CCT , to give to the society. Occasions when even physically challenged people donated blood and told me that they have a sense of satisfaction of helping the needy. When even under aged children not realizing that they will not be allowed , wanted to donate blood . I feel extremely humbled by the love showered by all of them, my fans and supporters. Through the journey over the years in CCT, such images of an innate urge of these common people, to serve the needy, show me the path, strengthen my determination and give me the confidence to move ahead, to achieve our goal, of a society that is free from Corneal Blindness and Deaths due to the shortage of blood.